The Costco Black Friday ad is out. Stores will open at 9:00am on Friday with regular hours Saturday and Sunday. They have a lot of online only deals going on between November 21 and December 18. Here is the Costco Black Friday Ad. Below are a few of the top deals from their ad. Offers Nov 20, 2011 in BlackFriday, Costco · Expired! I’ve been getting a lot of emails about “doll house” deals. Honestly, I think this is going to be the hot ticket item this year and we are going to see high prices for a while. 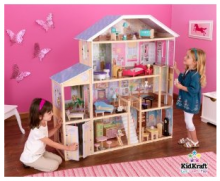 I did get a sneak peak at the Costco Black Friday Sale and they have a coupon for $40 off the KidKraft Majestic Doll House. It will be $139.99 after coupon. Amazon.com has the same doll house set right now for $153.60 with FREE shipping with Amazon prime. My GUESS is the Amazon price will come down once the Costco deal goes live. I’ll be posting more about “doll houses” since we’ve been considering one. I’m just not sold on the idea yet and our daughter is still happy as can be with her KidKraft kitchen from a couple years ago. I really struggle with anything that has a “membership” fee. If you are already spending money why do you have to pay a fee to do it? There are a few exceptions and I make one exception for Costco. Get a free sample of Dove Damage Therapy Shampoo and Conditioner from Costco. You don’t need to be a member to get this free offer. Leave the membership field blank. Allow 4-6 weeks for delivery, while supplies last. Thanks, Freebies 4 Mom!